Gary is out sick today so he couldn't write anything about his latest concept art. I hear this is the only bathroom in all of Thimbleweed County. That would be just like an adventure game, wouldn't it? Adventure games can be weird with the rarity of what would be common items in the real world. Back when I was working on Monkey Island, I remember playing a "competitor's" adventure game and there was a puzzle where you needed a pencil. My character was in LA and the only pencil in the game was back in New York. I had to get on a plane and fly across the country to get it. No shower? No phone numbers on the wall? After reading the pencil story, I'm relieved to see there's toilet paper. Ron, I can bet my fish bowls that you are referencing to Leisure Suit Larry 5 Passionate Patty!!! But what game was it? Les Manley Lost in LA? But were these games actual competitors? I remember Ken Williams saying he never played a LucasArts game, as the idea was not to copy what others were doing. Btw, Mr. Winnick, if you happen to read this, hope you get well soon! Is there a quarter slot, into which I need to insert a quarter, to use the toilet? A bathroom without stalls? Or do you have to lock the entrance door, thereby blocking everyone who only needs to wash their hands? I've never seen such a bathroom. And did they have air blowers back in 1985? Assuming I'm not being whooshed, but, yeah, this is a pretty typical single-occupancy bathroom in the US., and can be found in all sorts of places, including Starbucks. And, yes, those air driers have been around for decades before that. I have to say it again, it´s great to be part of this and to be able to see your thoughts while developing this stunning game. Get well soon, Gary Winnick. 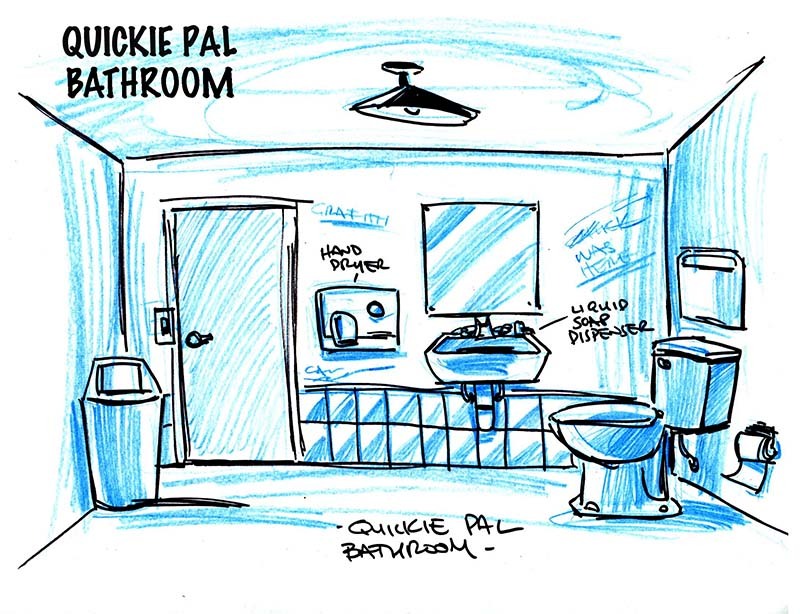 I assume Quickie Pal is the name of a convenience store in TP. This would explain a bathroom without a shower and also the layout of the bathroom. That kind of bathroom is very typical of the ones I encountered in the US, especially in grocery/convenience stores but sometimes also in bars and cafés. ... coincidence? I think not! Is this how you put the toilet paper into the holder? I think it needs to be done the other way. that's a years debate my partner and I have. I put it the other way, she puts it like it is in this concept art. @delMar: I can tell you're not a cat owner. @Roger: so, this is how it's done by cat owners? My family used to have cats when I was a kid. But you're right, no cats now. The rarity of that pencil needed justification; e.g., because it belonged to Fanny Palmer – an unconventional approach to the following problem: How to obtain antemortem dental records? You did't have competitors at that time, just market accompanist. I think what makes adventure games great is that you find replacements for stuff, like using charcoal for a pencil, or a bucket for a toilet. Is that Aha! moment that makes me feel Im the cleverest guy in the whole game. "Who would have thought of using breath mints to make the root beer fizzy? Me only, I rock.... yeah, this game is great...."
I remember I had a dream one night where I was inside an adventure game and I knew it, so I started picking up random common stuff filling my pockets with useless garbage "just in case I would need that later". It was a very strange sensation, since game and reality were mixed up pretty well. It's fun how in real life we would never bring something with us unless we're sure we need it, but we become kleptomaniacs in adventure games. So true. I played an interactive fiction game called "Hunger Daemon" recently which I loved. At various points it subtly pokes fun at the quirky nature of adventure games in this respect. I enjoy seeing that sort of "self-deprecating' humor in games. Me thinks Gary may have had a wee bit of referential inspiration for this piece whilst he was out sick. Coming back to this post after almost two years, I have only one word to say: under.